Obituary – Kingelin, Evelyn “Maxine” (Dolezal) « Perry High School Alumni Association, Inc.
﻿Glee Club, Orchestra, Red Hots, Girls Reserve, Blue Curtain Dramatic Club, Citizenship. Mrs. George ( Maxine Dolezal) Kingelin, 71, Jacksonville, Texas, formerly of Perry, died Thursday evening from injuries received in a one-vehicle accident near Troup, Texas. Funeral arrangements were pending Friday at Parker Funeral home. Mrs. Kingelin had been in Perry for the Tuesday funeral of her sister-in-law, Mrs. Frank (Victoria) Dolezal. She was returning home and was about 15 minutes from Jacksonville when the accident occurred. Exact details of the wreck were not available Friday. Born June 30, 1909, at Perry, she was the daughter of Joseph E. and Mary J. (Kasl) Dolezal. She was a graduate of Perry high school and Oklahoma College For Women. 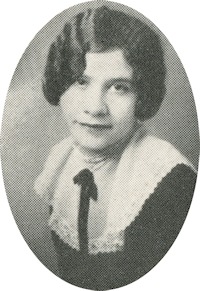 She taught school at Sumner before she and George J. Kingelin were married June 14, 1934, at Perry. Kingelin preceded his wife in death July 14, 1978. Mrs. Kingelin was a member of the Presbyterian church at Henderson, Texas. Survivors include one son, George F. (Rick) Kingelin, Rosenberg, Texas; two daughters, Mary Kathryn Kingelin, Shrevesport, La. ; and Carol Hilliard, St. Louis, Mo. ; three brothers, George and Al T. Dolezal, both of Perry; and Frank Dolezal, Stillwater, recently of Perry; and one sister, Irene Dolezal, Perry.